KPBS-TV atop Mt. 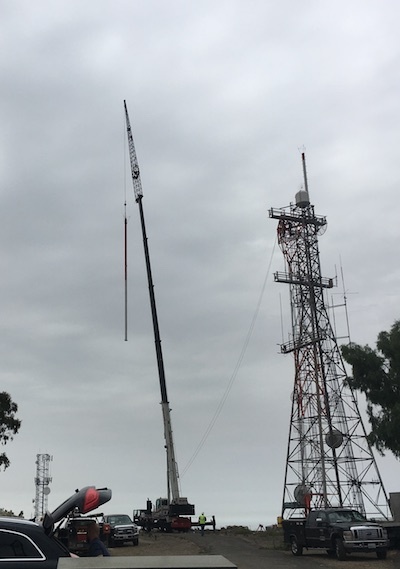 San Miguel tackled their antenna work last week as part of their TV spectrum repack project. They must move from UHF channel 30 to channel 19 while KSWB-TV moves from channel 19 to 26 and KNSD (TV) from 40 to 17. These full-power TV stations, all in Phase 2 of the FCC Broadcast Incentive Auction, must switch to the new channel alignment by April 12, 2019. I asked KPBS Director of Engineering and project coordinator Leon Messenie about recent activity. Leon: The project is going well. It goes in spurts. We just took delivery of the new antenna, mask filters, and transmission line so there is work going again. We just finished doing some reconfiguration inside the transmitter building which will allow us to continue removing a large CH30 mask filter and make the room needed for the two new channel 19 Mask Filters. You’re using Wireless Infrastructure, right? Yes. Wireless Infrastructure Services is doing our reconfiguration. 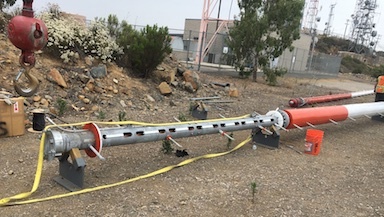 We took delivery of the new antenna Monday, July 9 and the crew removed the old analog ch15 antenna and installed the new channel 19 antenna on Tuesday, July 10. What kind of antenna and transmitter are you installing? The antenna is a Dielectric TFU18GTH/VP-R [cut for channel 19] and we are going to continue to use our Rohde & Schwarz NV8620 and NV8610 as a half power back-up. 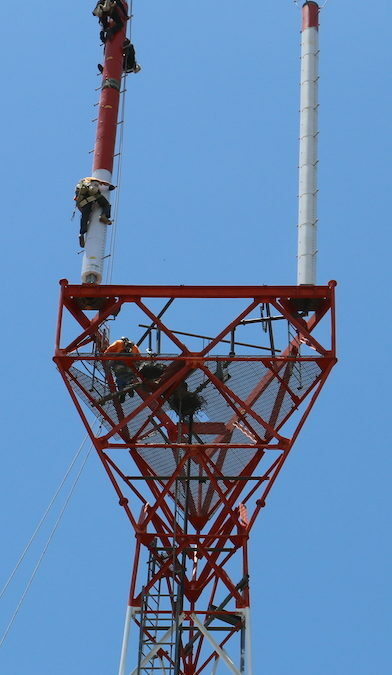 New channel 19 Dielectric antenna being fastened to the KPBS tower by Wireless Infrastructure Services climbers. Photo by Leon Messenie. Any interesting kinks or suggestions to share? The only thing I can speak to is to remember your transmitters have been probably running non-stop for a long time. When you start your repack work you may have to turn on and off the transmitter a few times. That could be enough to weaken hardline bullet connections. We suffered a burn out about 100′ up the tower. The good thing was the tower crew was already scheduled to continue work the next day and at KPBS we had two extra transmission line links and a few spare bullets. Bottom line–be prepared. If we did not have that spare transmission line I don’t know how long it would have taken to get replacement line from Dielectric. Thanks to the repack, supply may not always be available. Because we had everything at the site, the crew was able to troubleshoot, find the burnout, replace, and clean all remaining line to the bottom of the tower in 6-1/2 hours. 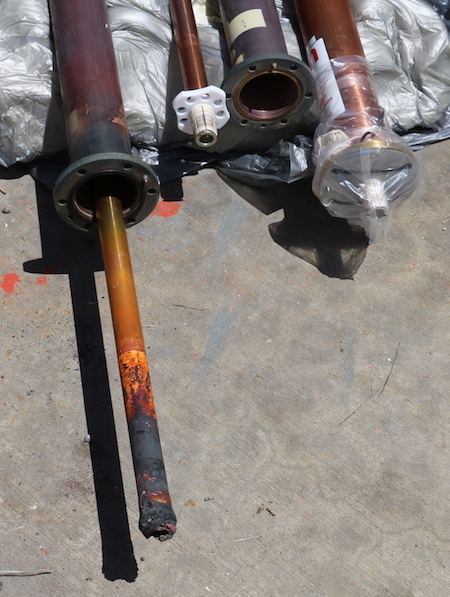 Heat-damaged hardline center conductor splice, a.k.a., “bullet connector.” Photo by Leon Messenie.